You’ve probably heard of Starbucks guilt-free Skinny lattes. In a tall size, which is a 12 oz. it has about 90 calories, 0 grams of fat and 9 grams of protein and their available in three yummy flavours like Caramel, Vanilla, Hazelnut and Cinnamon Dolce. When I go to Starbucks, I usually get a tall, soy mocha with light whip and I ask for only 1 pump of mocha. It usually comes with 3 pumps, but with light whip, that's way more sugar then I want in my coffee. Opt for nonfat milk. That saves up to 120 calories and 15g fat. Switch to sugar-free syrup or go with less pumps. That trims off about 20 calories and 5g sugar per pump of syrup! Hold the whip. Or if you have a craving for whip cream, just ask for light whip. Whipped cream adds about 50 to 110 calories and 5 to 11g of fat to your drink. Additional ways to shave some calories to your favorite Starbucks drink: Choose an iced drink. When you add ice, you displace some of the milk. So while you’ll be missing out on a little calcium, you’ll be saving a few calories. 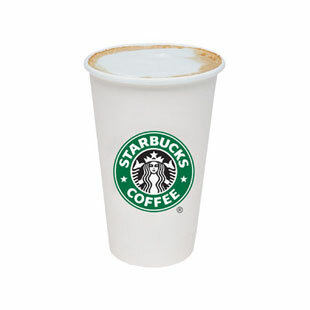 For example, a Tall Skinny Vanilla Latte is about 90 calories; the Iced version is only about 60.